I have been finding out as much as possible about clubs for a good few years now, researching different aspects of the movement and drawing upon as many types of resources as possible. It’s a fascinating journey that will one day (soon, I hope!) result not only in this website being even better informed but also a book on the history and development of clubs. I’m grateful to many people for their help including you, dear reader, and all those who contributed their own stories. I’d like to thank as well former CIU General Secretary Kevin Smyth, who retired in 2009, and Assistant General Secretary Maxine Murphy, for making available to me the treasure trove of over a hundred years of Club Journals and reports. And for their encouragement and support. This research is very important to me for a number of reasons. Some of my earliest childhood memories are of being taken out to the local club, the Canley Social in Coventry. It was conveniently located (sometimes, so my mother said, too much so!) just across the street and was almost like an extension of our living room. Although it was so near we didn’t get to go all the time as there were seven of us so we had to wait our turn. 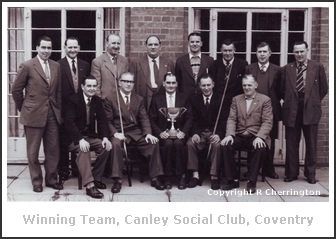 My dad was one of the earliest members when the Canley Club opened its doors in 1951. He loved to play bagatelle, billiards and dominoes as well as having a pint or three. Later in life he took up bowls and was quite good at that game too. Sadly my father is no longer with us but I have a photo of him over my desk, with him standing proudly over his CIU games trophies. The club dominated our social life as, indeed, it did for other residents on the local council estate. It was the same in other parts of Coventry and sometimes we would visit other clubs such as the Lime Tree Club which was just a short walk away over the railway track. As I grew up I realised what a huge role these clubs played in the life of local communities particularly in an industrial city such as Coventry. Many social and cultural events centred on the CIU clubs. I even remember playing in the school band at concerts there. The clubs were always about very much more than beer and bingo. I was saddened when the clubs started to go into decline in the late 1970s when the local car industry started to fail. The industrial decline, in which manufacturers were driven to close factories, decrease office space and lay-off workforce, also affected the clubs too. Things were similar elsewhere as the industries at the heart of working class communities started to disappear. Times were hard and the club across the street started to look increasingly empty and shabby. I started to write about these changes but my work took me abroad and my research on clubs was put on hold. Now, however, I am fully involved with finding out more about the social and community roles of clubs, particularly but not exclusively in Coventry which had a unique relationship with the council in the immediate post-war period. The council allocated plots of land for the setting up of clubs by local working men and offered favourable loans. It’s no wonder we had such big and lovely clubs in Coventry! And no wonder they were usually packed at the weekends. This is not the case now. I believe that the history of the key role that clubs played in communities needs documenting before too many more clubs either close or move into the private sector. Much of what clubs did and still strive to do go goes largely unacknowledged by the powers that be and by commentators who have never had any contact with clubs. They have also largely been neglected by my fellow academics so it’s high time to correct this state of affairs. Many of the older generation of clubmen, such as my own father, are no longer with us. They had stories to tell. Many clubs have also been lost but it’s not too late to document what they provided for young and old alike in their post-war heyday. In doing so, other people might take notice and perhaps feel more inclined to assist the CIU in keeping the club movement alive and well.